If you know me you will know I LOVE crisps, if crisps could provide all the nutrition I needed and I wouldn't get fat, I would honestly eat them all day! When I found out I was gluten intolerant and could not longer have all the flavours I used to love it was a very sad moment! (sob story time). So when I discovered Ten Acre at the Free From show I was over the moon as they had lots of lovely flavours! The type of flavours I thought I could no longer eat! 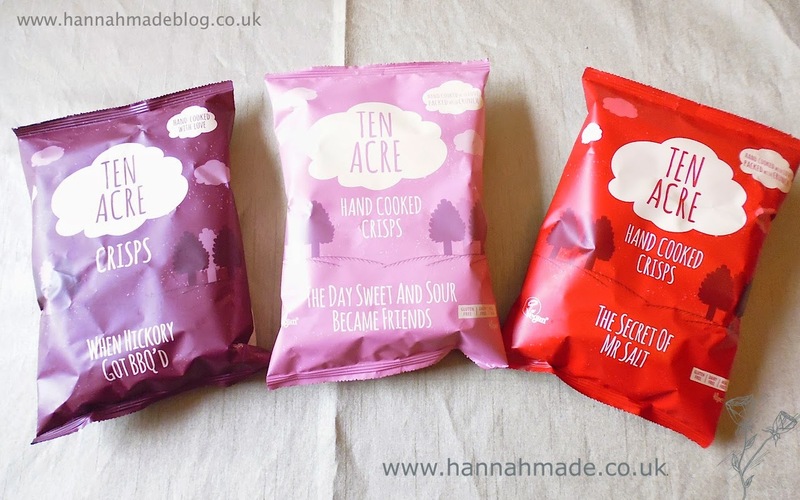 Ten Acre crisps are Gluten free, dairy free, MSG free and are vegan. They also have the coolest website, all I'll say is you have to check it out and then the crisps names will make sense! I picked up two of the BBQ flavour called When Hickory got BBQ'd, as this is one of my favourite flavours and I can rarely find gluten free in this flavour, I also got two sweet and sour flavours called The Day Sweet and Sour Became Friends and one pack of sea salt called The Secret of Mr Salt, I know many brands do salted crisps but I have never had such a nice salted crisp! These bags are 40g so are a typical coffee shop size bag and are on average 200 calories a bag. These crisps are finely sliced and very light and crispy, they have a thin layer of flavouring so it does not transfer onto your fingers but you can taste the seasonings well. In terms of comparison to a high street brand crisp I would compare them to Tyrells but I feel Ten Acre are sliced even thiner giving a lovely crisp, crunchy texture. Provide unusual flavours in gluten free! I cannot walk into my local shop and pick them up! I love these crisps and if you have a chance to try them I really recommend you do! I am a big crisps fan and I never knew that crisps could be made so tasty and fresh till I tasted Ten Acre crisps. It comes with a taste of love that you will not find in any other crisp. The classic Secret of Mr. Salt is my all time favorite crisp. I love Secret of Mr. Salt too! I know almost all salt crisps are gluten free but the taste of these are much better than any other I've had before. The flavouring is so even on them!